Again Sandtroopers are deployed in more than one place, and the packs and accessories are designed for a certain type of environment not a specific place. So I don't think its right to name them after a location, we don't call the current sandtroopers "Tatooine Sandroopers". Just like your classic costume "TD - Sandtrooper - ANH", this one should simply be called "TD - Sandtrooper - R1". For the Crystal Patrol Pack we should just call it "TD - Crystal Patrol Trooper - R1" which is much closer to official reference than "Kyber Sandtrooper". These packs are not necessarily all worn sandtroopers as the movie and all the official reference material would suggest, the other "Sandtrooper Type 4 Field Pack" is specifically meant for Sandtroopers. I believe these names are much more appropriate and will coincide better with the existing costume titles. If both of the backpacks from Rogue One will be going to MEPD I feel the official names of these CRL character titles need to be discussed because "Kyber Trooper" and "Jedha Trooper" just don't seem right at all! I'm sure Sandtroopers are deployed on more planets in the galaxy than just Jedha or Tatooine for that matter, The Sandtrooper packs, armor & accessories weren't designed for one specific location, but rather certain type of environment conditions. We don't currently call TDs "Tatooine Troopers" so I don't know where the term "Jedha Trooper" came from, it just seems wrong to me on more than one level. Although there was one action figure with "Jedha Patrol" written on the packaging but the term 'Jedha Patrol' makes sense in this case as it was a multiple figure set based on the troopers in that scene. Just like your classic costume "TD - Sandtrooper - ANH", this one should simply be called "TD - Sandtrooper - R1". In my humble opinion. It's fits in nicely and coincides with the other costume titles. And instead of "Kyber Trooper" I think we should also stick to the classic name in official reference material with the addition of the word 'trooper' instead of "duty". I suggest "TD - Crystal Patrol Trooper - R1", again this will coincide with the other costume titles as well as official reference material. Here are comparison images of the two different packs I've put together. Crystal Patrol Duty Pack on the left, Sandtrooper Type 4 Field Pack on the right. I still think that the first Stormtrooper in the movie wearing the pack while using the ‘TK’ designation ON SCREEN is a pretty big issue that we need to address. Allowing it as an optional accessory with the new R1 TK might be the simple solution to this issue. 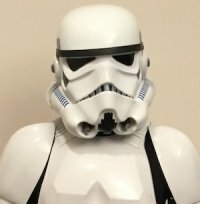 After all the visual guide does say this "field-specific kit can expand a standard Stormtrooper's versatility." Yes I see your point and I agree with you, I guess this has always been the case with Lucasfilm. I also don't understand why both detachments can't have the pack though, I feel based on all this evidence it should at least be an optional accessory with FISD but that's not my call to make. I too look forward to FISD and MEPD working together as well as the possibility of getting approved in another detachment with my pack if that ends up being the case. I just want to point out that even though the MEPD detachment is getting this pack, it is actually worn by standard Stormtroopers in the movie, not Sandtroopers. In fact even the troopers stationed on Jedha are officially Stormtroopers according to Lucasfilm/Disney, but that's not even the first place we see the pack being worn. The pack is first shown in one of the opening scenes of the movie at the Ring of Kafrene, it's not a sandy place at all it's a trading outpost. So it would make perfect sense that stormtroopers deployed there would be issued these packs to confiscate any kyber crystals attempted to be illegally traded or sold on the market. The only trooper in this scene can actually be heard identifying himself as "TK-62" using the standard stormtrooper designation TK prefix ON SCREEN! And if you turn on the subtitles the character's official name in the script is "STORMTROOPER 1", the first stormtrooper in the movie. This is also supported by the official Rogue One visual guide, a Lucasfilm licensed publication, as well as other official products and media. Disney/Lucasfilm is clearly presenting this character to the public as a Standard Stormtrooper and so far the 501st is not doing a very good job maintaining that continuity by calling it a Sandtrooper. This is the scene from the Ring of Kafrene trading outpost. This image is from the official Rogue One visual guide. Disney/Lucasfilm licensed publication. More images from the visual guide. Disney/Lucasfilm licensed publication. These images are from the book "Star Wars Stormtroopers Beyond the Armor". A Disney/Lucasfilm licensed publication. The TOPPS Star Wars Rogue One Stromtrooper Trading Card. Disney/Lucasfilm licensed product. The Hot Toys STORMTROOPER figure set includes Crystal Patrol Duty Pack. Another Lucasfilm licensed product. The Hot Toys STORMTROOPER figure set is called “TK-14057” we all know the 'TK' prefix is a standard Stormtrooper designation. Rogue One -- Jehda Patrols are "Sandtroopers"
Very nice reference photo! What is the original source of that image, do you know where was it taken from? Is it a screenshot from the movie, I don't think I've seen that picture before. Ok first off not all troopers posted on Jedha are Sandtroopers, not even close. In fact there are only a few who are and I'm not even sure if those ones made it to the final cut. There are NOT 2 different packs to choose from! One pack is specifically designed for sandtroopers while the other pack IS NOT! The "ammo box version" you're referring to is in fact a "field-specific kit" designed for "Standard Stormtroopers" according to the Rogue One visual guide, and yes this is a Lucasfilm licensed book. These packs are designed for "Crystal Patrol Duty". Read the paragraph in the image below Looking at the Norwegian Grenade Case (or "ammo box") it does have the appearance of "Vac-Sealed Armoured Canisters". Considering the history and significance of Kyber Crystals not only in the Rogue One plot but the Star Wars universe in general I'd say this makes absolute perfect sense! They would definitely have been kept in a "well-secured backpack" once confiscated by the empire, at least temporarily until ready for "delivery to Eadu" to be refined into fuel for their super weapon. On a side note, this also makes perfect sense as to why we first see one of these packs at the Kafrene Trading Outpost which is not on the planet Jedha. The Empire would definitely deploy "standard stormtroopers" issued with these "field specific kits" at the nearby trading outpost in order to capture and confiscate any crystals from citizens attempting to trade them on the market. This also explains why the pack was displayed on a TK at Celebration Europe and not a TD. The pack at CE looks like it has mud splashed on it from walking/running and being set down on the ground, but the stormtrooper armor is standard shiny white like he just stepped off a star destroyer. The pack designed for sandtroopers is a 'hard pack' that slightly resembles the original TD packs from ANH. I took this photograph myself from my own personal copy of the Rogue One Visual Guide. As you can see this is a "Sandtrooper Type 4 Field pack" The paragraph below focuses on the armor itself , it doesn't actually mention the packs at all but this is what the sandtroopers in this image are wearing. Notice the base of the antenna is above their shoulders and the lack of shoulder straps or a hook greeblie. Also seen on the Hot Toys Jedha Patrol action figure. Again, notice the antenna base and lack of shoulder straps. Correct, it's been confirmed and now we know for certain; There are two packs, one is a "field-specific kit" issued to "standard stormtroopers" for "crystal patrol duty". While the other "Sandtrooper Type 4 Field Pack" is obviously designed for a TD. Neither of these packs received significant screen time but I've seen the film several times now and I've been able to spot the crystal patrol duty packs 3 or 4 times in a few different scenes. Though just like anything else seen in the films; regardless of screen time these packs are now officially part of Star Wars canon history and the visual guide itself is Lucasfilm/Disney Licensed.